Best Repair Technique for Cracked Poly? Discussion in 'Luthier's Guitar & Bass Technical Discussion' started by ToneRanger72, May 10, 2016. Gotta love that fragile, MIM poly. 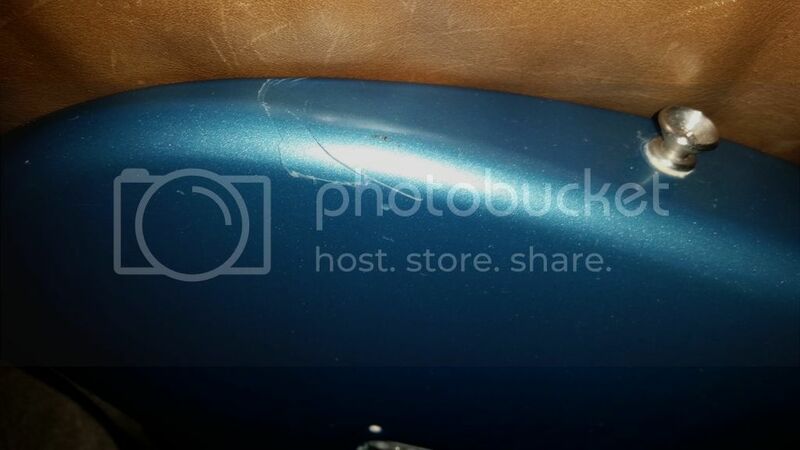 Bought a mid 90's MIM LPB body on flEabay and it apparently got damaged in transit, as the damage did not show in the listing pics and the seller had been very up front about a couple of other minor issues. My question is - is there a good way to seal the crack before it completely comes off? As you can see it's a pretty big chunk. Right now I have some blue painter's tape to keep things from spreading and getting worse, and the color is close enough that it doesn't jump out, but it would be nice to permanently seal it in place somehow. Any ideas? I've heard Super Glue is an option, but are there other techniques? Water-thin super glue will stabilize it, but it won't hide. That one would be nearly impossible to 'fix' invisibly. Yeah, I don't need to hide the crack - just keep the existing material in place. Yes, judicious application of water thin CA. But, really - I don't think it's going anywhere.